A: Segmentation means categorizing your audience. You collect data and segment or slice it in to different categories. Segmentation is also referred to as filtering. Q: Why is it special? A: Because it is a very powerful (marketing) tool, especially with web and app media that can be adjusted to audience. Additionally both the technology and its presentation are complicated. In this case it is special because our system allows you to set up to three segments at a time. In other words: Show me 1) all Females 2) with the Relation Status “Single” 3) accessing my app on an iPhone. Figure 1. 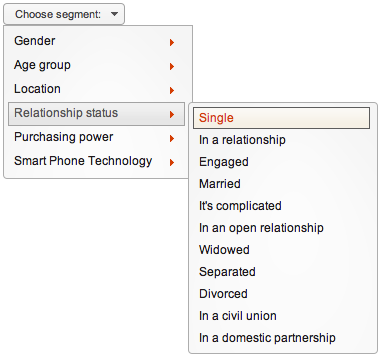 Here is a segment which allows you to select a segment of your data which displays Relationship Status. Q: What does it really do for me? A: Segmentation adds an extra dimension to your reporting so that you can slice your data based on a variable of your choice. Perhaps the greatest power of this solution is the custom metrics you can segment. In other words, you can send us any segment that you can think of and we will put it into your reports. You can then segment it with any other data collected. So, for example, we think that this can be very powerful when an app or website’s data is segmented by gender. In other words, you can use Facebook as a tool to leverage the data you are getting. Segmentation by social media would allow you to build, for example, queries to show you people who logged in via facebook, their age, gender, birthday, etc, as determined by whether or not they chose to make that info public in their profile. Who logs into my app via FB – are they using Android or iPhone? Further examples would be: people logging in to your app via FB, or launching on android or iphone. Both these examples can then be further segmented by country or loyalty (return users). By default you can slice by android, iphone or country. You can create additional segments based on your data and needs. Interested? You should be – this is cutting edge technology at its most useful.